Official X3 1st gen firmware thread--3.34beta: removed 5800 song limit, play through folders--Happy Chinese New Year! Discussion in 'FiiO' started by joe bloggs, Nov 12, 2014. Beta firmware version 3.34 for the X3 is now available! After downloading the update, please unpack (unRAR / unZIP) the package and read the update instructions contained within. 1. Path memory feature: Pressing the Back button from the Now Playing screen will now always take you to the folder / album / etc. from which the current song is selected. This is true even after navigating to the main menu or powering the X3 off and back on. 2. Removed 5800 song limit on number of songs that may be indexed by the X3 media library. 3. Added option to play through folders: ie skipping to the first song in the next folder after the last song in the current folder. 4. Added option to delete a whole folder. 5. Fixed issue where artist info cannot be shown on the Now Playing screen. The X3 can read playlists with relative pathing and thus is compatible with most existing playlists that do not reference the drive letter at the beginning of each track reference. For best compatibility, the playlists should be above the referenced tracks in directory level. 2. 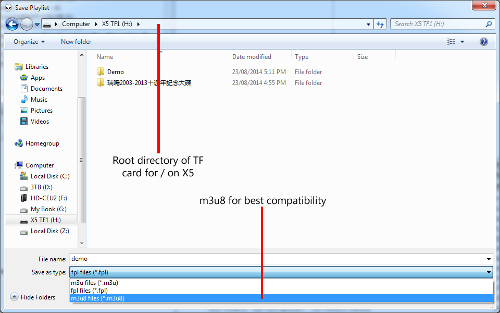 Load the songs desired from the SD card into a new playlist and save the playlist as a M3U8 file in the root directory of the SD card. 1. Added support for M3U playlists. 2. 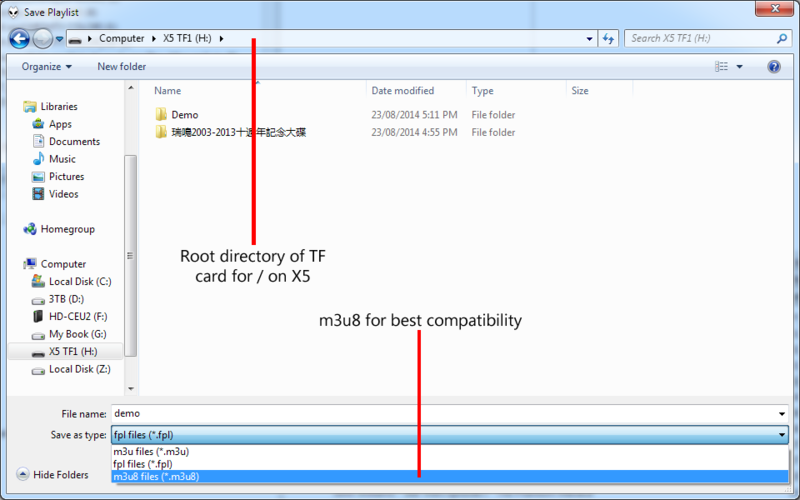 Added support for exFAT formatted micro SD cards. 3. Added 5-band equalizer and support for equalizer presets (via changing provided presets). 4. Added support for folder-based album art (e.g. "cover.jpg" for all songs in a folder). 5. Added playback support for multichannel recordings. 6. Added feature to display ID3-based song title rather than filename in Now Playing screen. 7. Added Sleep timer, with on/off toggle switch and timer setting. 8. Added support for UTF-8 (no BOM) and Unicode LRC lyrics files. 9. Media library will now auto-update upon insertion and removal of TF (micro SD) cards when media library update is set to Auto. 10. Added option to display "all songs" by an artist as well as selecting individual albums by an artist. 2. Fixed issue where hidden files would be generated in the X3 after connection to Mac and other Unix-based computers and affect file browsing afterwards. 3. Optimized song ordering in albums. 4. Optimized randomization of songs in shuffle mode. 6. Various other bug fixes. Looking forward to everyone's feedback. Beta firmware version 3.22beta for the X3 is now available! 4. Fixed issue where hidden files would be generated in the X3 after connection to Mac and other Unix-based computers and affect file browsing afterwards. 1. Improved battery indicator showing battery percentage. 2. Amended EQ setting interface to better correspond with the instructions given in the EQ tutorial. 3. Improved smoothness of song transitions between songs of different formats and sample rates. 4. Fixed issue where songs in an album were sometimes not sorted according to track number. 5. Fixed issue where changes to preset EQ settings are not saved through power-off. 6. Fixed issue where equalizer was not taking effect after resuming from the last song / last position after power-off and power-on. 7. Fixed issue where holding a volume button while the X3 is powered off and charging shows the volume control dialog and causes the X3 not to respond to other buttons. 8. Internal playlists are now hidden from the Browse Files view to reduce clutter. 2. Problems encountered with this firmware may be posted to this thread--please keep the main X3 thread free from clutter regarding bugs on beta firmware. 3. To avoid public misunderstanding, please refrain from posting about bugs and problems with the beta firmware outside this beta firmware discussion thread. "Dammit man, WHAT DO YOU DO FOR A LIVING?" "I... sell shoes? " Wedgy-fi: official Head-Fi SWAT team uniform since 2004. Proudly worn on the head by the team founder to this day. kamcok, Marlene, SCTinkering and 2 others like this. Thanks Joe - Awesome support as always. Joe, what about song limit? Great! I'll try it out tonight. Gapless playback fixed!!! Thanks! Album art still cropped, however. How is the (unequalized) sound, compared to 3.21b? Joe, thanks so much for posting this latest firmware from FiiO! Very happy with 3.22B!! Awesome. IEMs: Etymotic Research ER4SR / HiFiMan RE400s "Waterline"
Edit 2: Seems like this release is somewhat less tolerant of "home brewed" rips from things like Blu Ray tracks. I will keep testing but that is an initial consideration. I am getting a slight stutter or hesitation from tracks from the new Pink Floyd release. Sweet! Thanks for the update Joe! Awesome! Thanks getting this out quickly, Eq looks to be much better implemented that the previous beta with eq. Funny you say this, I don't see a difference in sound compared to the 2.14 beta. I tried to put all sliders at max (+6 db), then decrease each level one by one and still can't hear a real difference. It seems for me that tone settings has much more impact on sound than the EQ. I use +2 Bass and +6 Trebbles with my Grado SR80i, if someone can find a clearer (or brighter) sound (without loosing on bass depth) with EQ, thanks in advance for giving us your setings! I created a playlist on the device which worked perfectly. So I decided to try creating one on my computer. I wanted to copy the playlist over using a card reader (no cable to hand) so I removed the card from the X3. However, I suspect that the X3 didn't flush all the changes to the card because now my card is corrupted. The card is a 128GB one, formatted in exFAT.